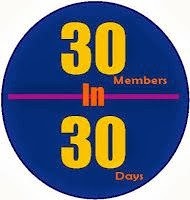 We're ending the first week of our 30 Members in 30 Days campaign for Northern Colorado Writers, and we already have a number of new folks who have joined our ranks. Still, we want to reach our goal of because, well, we're greedy. Thing is, how can we entice you folks to join our community of authors without locking you in a bare room and subjecting you to constant airings of The New Atlanta? And then it hit me and NCW founder Kerrie Flanagan -- we need to give away stuff like they do in public radio and television pledge drives. You know, for a $50 donation you get a tote bag, and for a $5000 donation you get a, um, bigger tote bag. Don't worry, we don't have any tote bags, but we will give away a number of prizes to old and new NCW folks if we reach our goal of 30 members within the allotted time period. What are these prizes, you ask? As they used to say back in that era known as the Olden Days -- Johnny, tell our audience what they can win. And a life time supply of Rice-a-Roni, the San Francisco treat, and Turtle Wax. Rich: Are you sure about those last two? Johnny: Well, Rich, those are what people win when they participate in a game show. Rich: This isn't a game show. Johnny: Who's doing these announcements, author boy? Johnny: In addition, everyone is invited to a party on October 27th to celebrate NCW's 7th anniversary and hear music by the Bay City Rollers and ABBA. Rich: Now you're just getting silly. Johnny: Well, I know where you live, Rich. Ahem. Needless to say, you'll have a chance to receive some nice swag if you join NCW before the end of the month. Take some time to join at the Northern Colorado Writers website today, or I may need to bring Johnny back. Johnny: I'll ruin your manuscript with commas and crutch words. You, and Johnny too, make me laugh.